Horses are very adaptable creatures, and most can live outside all year round, provided they have food, shelter and protection from the elements. So, why the need for stables? A stable is not a natural environment for a horse but it is an essential provision. Any horse may need stabling at a moment’s notice due to sickness or injury and as the horse owner, you should be able to provide adequate shelter for your horse. A stable provides essential protection for your horse from the elements. We all know how much the English weather can drastically change from one day to the next and it is important you are one step ahead. This can be as simple as the natural shelters available in your horse’s field, such as trees or shrubs, or it could be a mobile field shelter. Having a stable available to your horse is essential to ensure protection from the elements. 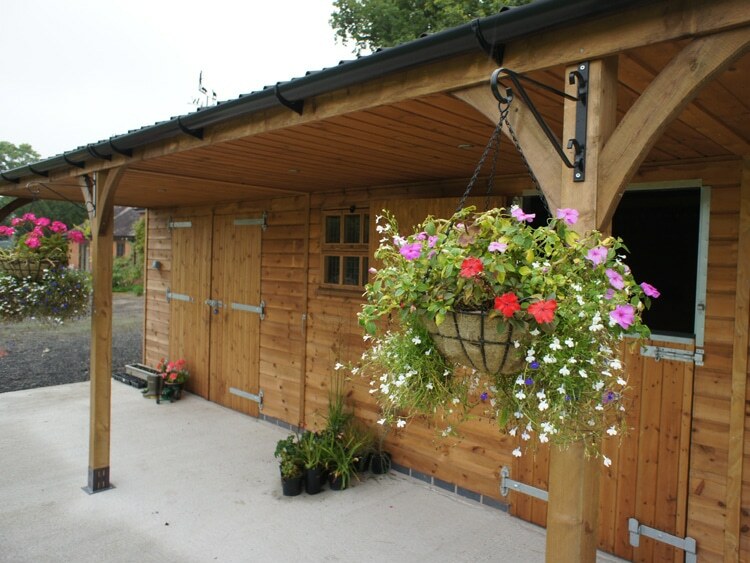 If the rain is hammering down, the stable provides shelter for your horse where he can keep dry and rest. Although horses can bear temperatures significantly lower than humans are comfortable with, it is important horses can seek warmth in the stable if the temperatures become unbearable for them. The horse stable is almost as cold as outside, but it offers straw bedding, feed, fresh water and protection from the chilling wind or the snow. The stable is also a comforting place for many horses where they know they are safe. If poorly built and maintained, your horse stables could pose a significant health risk to your horse. Therefore, it is important to ensure your stables are properly ventilated, have adequate drainage and are kept clean and as dust-free as possible to ensure the comfort of your horse. Stabling is essential for your horse because it helps you control your horse’s diet. If you have pastures that are particularly luscious and healthy, ponies particularly can easily overeat and become overweight. An overweight horse is more likely to suffer from laminitis, so it is important to restrict your horse’s diet if their weight is concerning. This is where the stable is essential as it helps owners to restrict grazing by stabling their horse and controlling their feed intake. Stabling to control diet is especially important for competition horses and, in such circumstances, stabling may be the only (and kindest) option for restricting and controlling diet for optimum health and performance to be successfully achieved. One of the most popular reasons for horse stabling is convenience. This is valid, providing the health of the horse is not compromised. Stabling your horse is extremely convenient as a stabled horse tends to be clean, well-kept and easily-accessible when you want to ride. A stabled horse also has less risk of injury than horses left out in a field with other horses. As long as you’re balancing the time your horse spends in the stable with his active routine outside and his time spent grazing on pasture, horse stables are very convenient for the owner. Horses, like people, are individuals. Each horse has different likes and dislikes and, therefore, each horse will respond differently in the stable. Some horses like to be around other horses for the majority of the day, in which case it would be beneficial to stable them in a sociable space where they can see and hear other horses. However, other horses prefer their own space that is peaceful and quiet, so stabling him in an isolated stall or quieter location of the yard may help him to relax. Stables can cater to the unique needs of your horse, providing a safe space for them to rest properly. Groups of horses often enjoy being kept together in communal stables. Horses are naturally herd animals and tend to enjoy the company of other horses. By stabling your horses together, you allow for socialisation within the stables. However, care should be taken when selecting the horses that are compatible. Horses that are naturally more aggressive should be segregated to prevent injury. If kept on their own, horses require more human contact and supervision. If you must isolate a horse from the herd and stable it in its own stall, be sure to provide socialisation by attending to him frequently or, when necessary, placing a radio within hearing distance so that he can hear human voices on days when you can’t be with him. Having access to stables allows you to tether your horse in a safe space where he is protected from the elements. Tethering your horse is where you secure your horse, using an appropriately attached chain or rope, to a desired area, confining it to one space. Although tethering must not be used as a long-term strategy, it is very beneficial should you need to secure your animal for inspection or grooming. Having a solid stable structure allows you to successfully tether your horse for short amounts of time in an environment that is safe and protected from the elements. Do You Need a Stable for Your Horse? If you would like any more information about horse stables, which are the best choice for you and where to buy them, why not check out our range at Prime Stables? We sell a variety of functional and impressive horse stables that are hand-crafted by our team of professional in-house carpenters. Do you care for your horse? Buy our horse stables today!